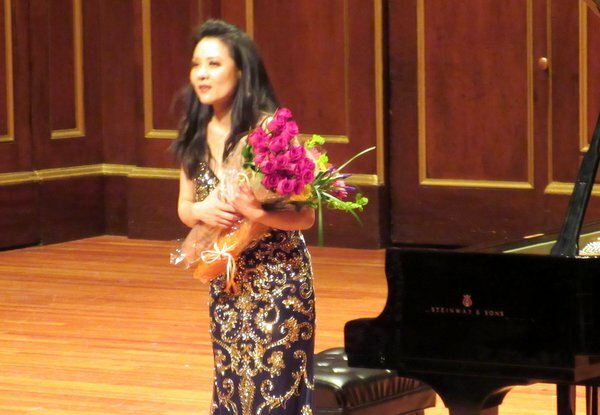 Boston, April 6, 2015, — the Foundation for Chinese Performing Arts presented pianist Ya-Fei Chuang at NEC’s Jordan Hall on March 28 to hundreds of enthusiastic fans of classic music in the audience. Ms. Cathy Chan was very pleasured as “many heavy weight figures from the music world were in the audience.” Certainly, Ms. Chuang didn’t disappoint them. Ms. Chuang performed Chopin’s 24 Preludes Op. 28, Liszt’s Sonata in B Minor, and Ravel’s La Valse. Responding to heartfelt ovations and showers of flowers, Ms. Chuang rewarded the audience with two encores (Gershwin and Schubert). Acclaimed by critics worldwide for her stunning virtuosity, refinement and communicative power, pianist Ya-Fei Chuang has appeared at numerous international festivals, including the Beethoven (Warsaw), the European/Musikfest Stuttgart, the Bach (Leipzig), the Ruhr Piano, and the festivals of Schleswig-Holstein, Gilmore, Ravinia, Sarasota, and Tanglewood. Her recent appearances include the symphonies of the City of Birmingham, the Israel, the Malaysian, at prestigious venues including the London’s Queen Elisabeth Hall, and in Tel Aviv, Salzburg, South America, and at the International Grieg Piano Competition in Norway (where she was a member of the jury). She has recorded for ECM, Harmonia Mundi, Naxos, and New York Philomusica Records. The Ruhr Festival has released several of her live recordings, including a solo album as a premium of Fono Forum Magazine. Fanfare Magazine hailed her “delicacy and fluidity of touch.” Her recording of Hindemith chamber works was awarded a special prize by the International Record Review. Upcoming performances include the festivals of Verbier, Oregon Bach, the Mozartwoche in Salzburg, the Mozart Festival in Cluj-Napoca, Romania, among others. Ya-Fei Chuang has given the world premieres of works by John Harbison, Stanley Walden, and Thomas Oboe Lee. She is on the faculty of the Boston Conservatory and the New England Conservatory Preparatory. Ms. Chuang earned an artist diploma with honors at Musikhochschule Freiburg (Germany), and also completed a soloist exam (final performance degree) at Musikhochschule Cologne and a graduate diploma at the New England Conservatory with Russell Sherman. Currently, she teaches at Boston Conservatory and the New England Conservatory Preparatory.